Adult and young common loons swim on Loon Lake, Wyoming near Yellowstone National Park. We could see the loons through the spotting scope swimming slowly along the edge of lily pads. As the sunset reflected off the still water, we watched an adult repeatedly dive and come back to its youngster to share tasty morsels from his hunts. We were at Loon Lake in Wyoming, just south of the Yellowstone border off the Reclamation Road to Grassy Lake Reservoir. It was one of the few times I have been at a location named for a wild critter where that animal was actually present. In fact, the pair at Loon Lake is one of only 16 loon pairs in Wyoming. The others occupy mostly small lakes in the same general area, with one pair per lake. Yellowstone Lake supports three pairs. If you have never seen a common loon, you are missing out. A loon is a large bird, much larger than a mallard duck. 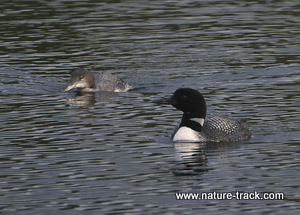 The male and female loons are similar and are some of the most elegantly handsome birds on the planet. Starting with a solid black head garnished with a reddish eye and a white chest and belly, they are a mix of black and white stripes and checks. A broad dark neck band is black or iridescent green, depending upon the light. But seeing a loon is only part of the magic. Much like a wolf’s howl, loon music is the embodiment of wildness. They are best known for their mournful yodel, a sound that can carry easily for a mile or more. Loons are excellent swimmers and dive deeply for fish and other prey. They also fly strong and fast. However, the transition from swimming to flying is awkward. Because of exceptionally high wing loading—the wings are small compared to the body—it may take a loon a quarter of a mile to get airborne. And that makes the loons of Western Wyoming unique. They are smaller bodied than their eastern cousins and can launch more quickly. That allows them to utilize the relatively small bodies of water in the area. Finding loons this close by is really a gift. This small population is very isolated from other loons. Officially, Idaho only has one nesting pair, far to the north in the Panhandle. You would have to travel 200 miles to see the closest of Montana’s 72 breeding pairs. Sadly, just recently, the male of Idaho’s official pair was found dead, apparently from ingesting fishing tackle made from lead. Because loons are particularly shy and intolerant of disturbance, some ardent birdwatchers may chastise me for “hotspotting” these loons. I do hope you get the chance to enjoy them though. Just follow a couple of simple rules: first, view them from a distance and do not approach loons on foot or by boat. Second, if you fish in loon occupied habitat, use non-toxic tackle. 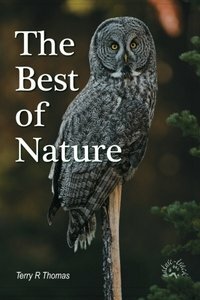 Few things awaken a love for wilderness like watching loons on the quiet waters of a tree-lined lake and listening to their haunting music. May we always protect the wildness that they represent.